I freely confess that I have decidedly mixed emotions about Bunha Faun… And if you happen to do a bit of surfing among the social media, you’ll catch of hint of that ambivalence here and there as well. 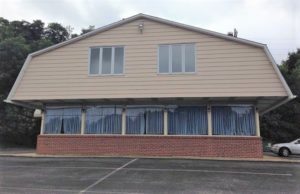 For the most part, this is neither a gripe with the cuisine nor with its rather unassuming surroundings (for although the restaurant is housed in a former Dairy Queen, the interior is tastefully appointed). No, the major complaint with Bunha Faun, both on social media and during my own dining experiences, has been the service… a two-fold issue involving both servers and the kitchen. 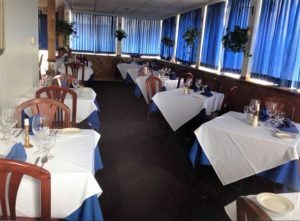 On one Thursday night, for example, there appeared to be but two individuals taking care of the entire restaurant: the chef in the kitchen and one server in the dining room. And since there was a totally unexpected influx of diners on this particular evening, as you can well imagine, the pace at which food arrived at table was somewhat slower than a herd of turtles. My dining partner and I would gladly have tried dessert, but since this would have added at least another hour onto what we considered to be an already overextended stay, we opted to exit stage right. At Bunha Faun, unfortunately, this kind of occurrence seems to be more the rule than the exception. And local scuttlebutt has it that even though the restaurant is located just around the corner from People’s Light and Theatre Company, those who plan to attend a performance hesitate to dine here precisely because of the events described immediately above. And this is also unfortunate, as the outstanding quality of the Asian-influenced French cuisine certainly belies the sometimes-spotty service. … And once the Snow Pea Salad (pictured) hits and table, you know you’re in capable hands. 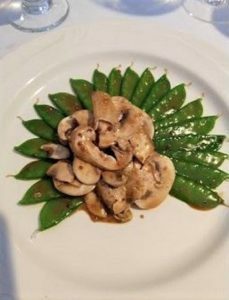 Sublime in its apparent simplicity, the presentation incorporates only snow peas and mushrooms. However, as you note, the components are attractively arranged to please the eye as well as the palate, with sesame dressing providing the beguiling pièce de résistance. The Baby Spinach Salad – tossed with mushrooms & bacon bits and splashed with sherry vinaigrette – while not as photogenic, is also quite excellent. The aforementioned sesame dressing also adds a good deal of pizzazz to the Oriental Noodles, with morsels of perfectly cooked chicken, carrots, broccoli, peanuts, and tofu in strong supporting roles. Other pasta starters include Black Angel Hair sautéed with crabmeat and Crab Ravioli in fresh tomato sauce. My nod for the favorite noodle opener, though, goes to the Green Angel Hair (pictured). 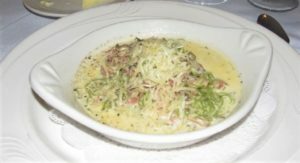 Sautéed with prosciutto and mushrooms, it luxuriates in a lusty cream sauce and is finished with a tiara of parmesan cheese. As you move on to the entrées, the French influence becomes more prominent, the Asian subtitles less so. Sauces abound… but they are invariably light & complementary rather than smothering & intrusive. 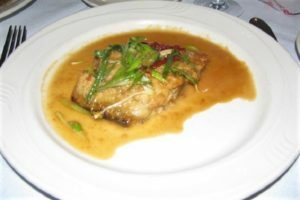 The Escalop of Chicken and Escalop of Veal (pictured with haricots verts and scalloped potatoes), for example, are both caressed by white wine sauces… the former embellished with apricot and ginger, the latter with wild mushrooms and prosciutto. In both cases, the flesh is moist and succulent, the sauces ethereal. Other interesting possibilities include Filet Mignon wrapped in bacon and served with green peppercorns in a rich red wine sauce, Roast Duckling garnished with seasonal fruit, and a generous herb-encrusted Rack of Lamb adorned with a tangy mustard sauce. Matters piscatorial are a bit on the sparse side… The Sweet Red Pepper Shrimp and the Fish of the Day are the only items noted on the printed menu. However, Shrimp & Scallops, in various incarnations, do put in frequent guest appearances. The most recently sampled seafood item was the ever-popular Barramundi (pictured), a mild white fish with a texture somewhat akin to halibut. This was an excellent rendition; the flesh was moist & flaky and the ginger-scallion sauce a marvelous treat for the palate. Desserts here are something of a low point. The only item made in-house is the Crème Brûlée, all others are trucked in from off-campus. And this is really a shame, as just a few more selections would add immensely to the total dining experience. One final note… Dining at Bunha Faun can be either a tremendously rewarding or a thoroughly frustrating experience. 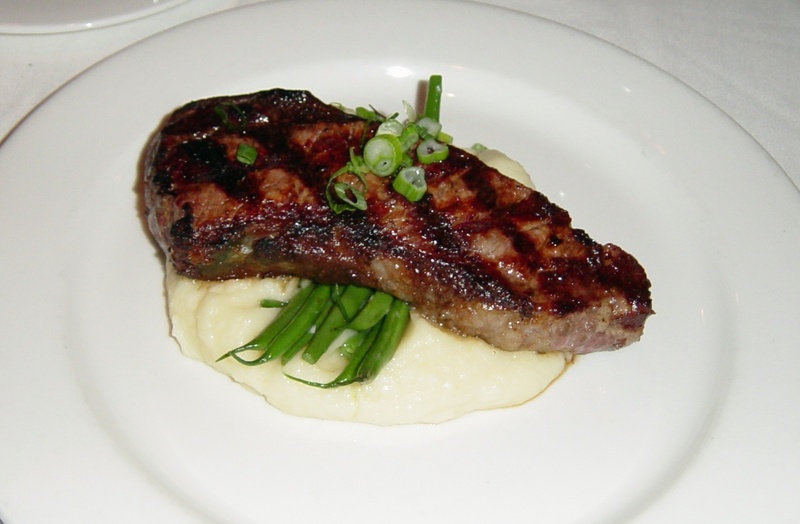 The cuisine is carefully prepared and nicely presented; and, given its overall quality, quite reasonably priced. In addition, you may also BYOB (and there is no corkage fee), which certainly reduces the strain on your pocketbook. On the other hand, the service, as noted at the outset of this review, tends to be as schizophrenic as Dr. Jekyll and Mr. Hyde. On one evening, it may be spot on; on another, because of a shortage of staff, it may be insufferably slow… And you never quite know what side of its erratic personality is going to put in an appearance. Given the restaurant’s eccentricities, is it worth a visit…? Yes, in my opinion. However… hoping for the best while expecting the worst may be your best course of action to avoid disappointment.